The main focus of this article is on the perceptions of educational practitioners (at the lower secondary level) regarding obstacles that seriously impede the realization of ICT-related goals of schools. The results are from a worldwide survey among national representative samples of schools from 26 countries. 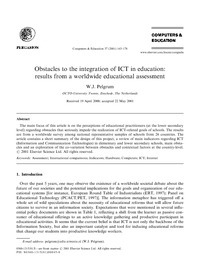 The article contains a short summary of the design of this project, a review of main indicators regarding ICT (Information and Communication Technologies) in elementary and lower secondary schools, main obstacles and an exploration of the co-variation between obstacles and contextual factors at the country-level.